As pancake day is imminent, I thought I’d post this delectable discovery I made last weekend. 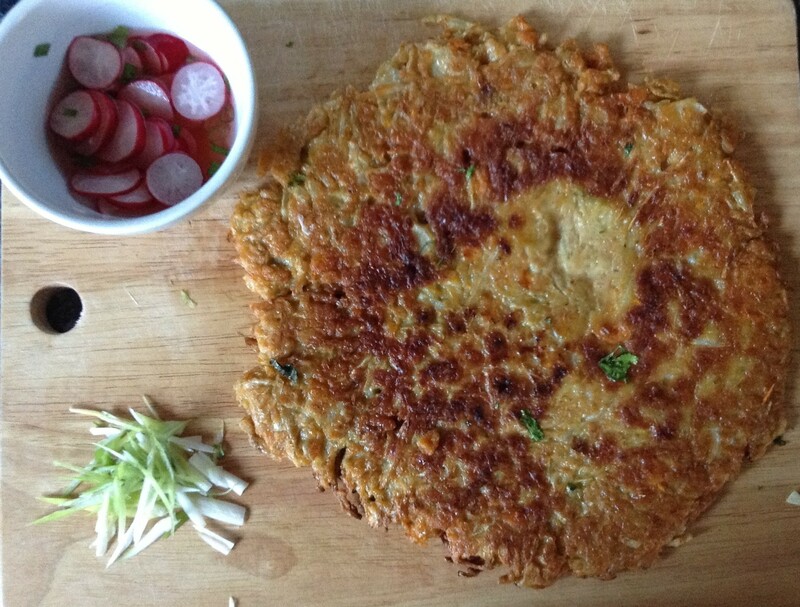 I’m not sure how I stumbled across this mouthful of a Japanese pancake, probably searching for something more interesting to do with cabbage than make soup or add it to a stir fry. This is definitely different and you can add pretty much any vegetables you have laying around, so it’s pretty versatile. 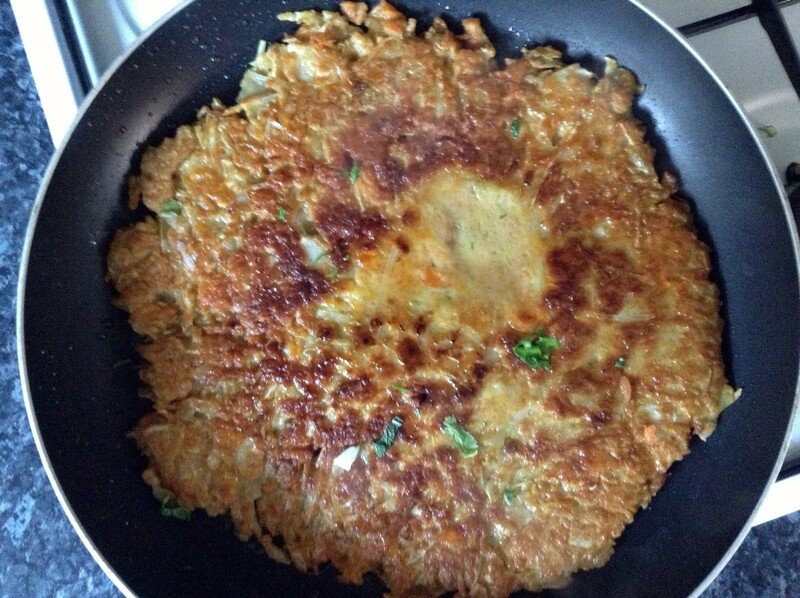 It’s a simple batter with shredded veg thrown in. 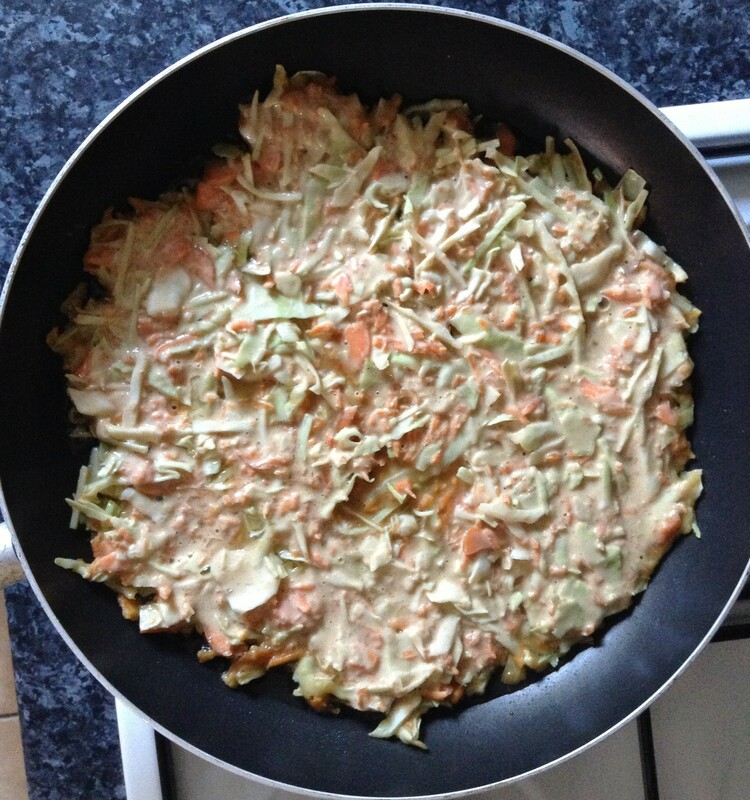 I used one zucchini (courgette for the Brits), one carrot and a quarter of a white cabbage. The batter is one egg, one cup of flour and three quarters of a cup of dashi – a stock made from kombu (kelp) and bonito flakes – or water. If you want to try to recreate the dashi you can add a bit of fish sauce and soy sauce to the water. You mix it all together and fry it on low for about 10 to 15 minutes on each side until it’s golden and firm to the touch. Now we come to the flip. The recipes I saw suggested multiple flips with multiple plates, etc, etc. That sounds like a lot of hard work – not to mention dirty dishes – so I just shimmied the massive pancake onto a large cutting board, gathered my courage and flipped it back into the pan starting from the end of the board closest to me. I managed to do this twice without any catastrophes. They key is not to doubt or double guess it, just do it. Be strong for the pancake and the pancake will be strong for you. I cooked mine on too high a heat, so it wasn’t quite cooked through even though it was on the verge of burning, so I finished it in a 375°F (180°C) oven. 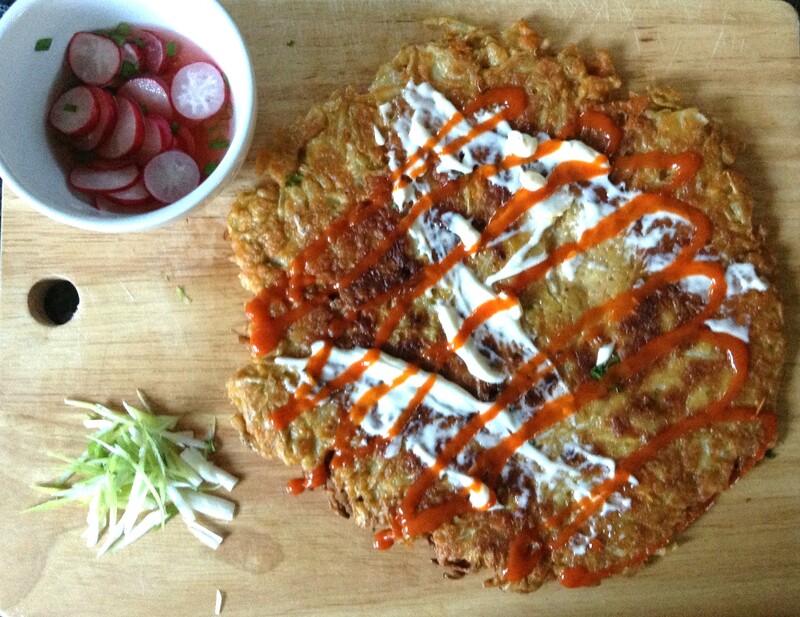 You serve it with sliced green onions, mayonnaise and sriracha. A lovely, street food-esque lunch full of vegetables! It’d probably be delicious with a pickled vegetable salad and a cold Asahi. P.S. We had the leftovers for brunch the next morning, just reheated in a 375°F oven for about 10 to 15 minutes and served exactly the same way but with the heavenly addition of a poached egg. I am not exaggerating, it was glorious. 1. Mix flour and dashi or water, soy sauce and fish sauce mixture together. 2. Add shredded vegetables and stir to combine. 3. Heat oil over medium heat, then add batter and vegetables and smooth to make an even layer. 4. Cook over medium heat for 7-10 minutes until golden. 5. Flip (don’t over think it, just do it!) and cook on the other side for 7-10 minutes until golden and cooked through. 6. Serve drizzled with mayonnaise (Japanese mayonnaise if you want to be very authentic), sriracha or other chilli sauce and thinly sliced green onions (spring onions).